MANILA, Philippines — Today, 01 July 2016. 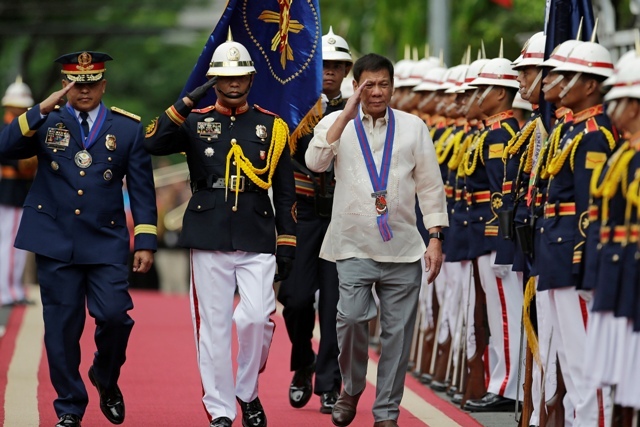 The President of the Philippines Rodrigo Duterte told the PN (Philippine National Police) that he will not tolerate scalawags in the police force and advised them to avoid the company of drug lords. President Duterte said that "Do not bullsh*t with me but do your duty, I will die for you,". In his speech after the oath-taking ceremony of PNP chief Ronald "Bato" Dela Rosa, Duterte said that he knows that some police officials are involved in illegal activities. "I know your life story. I know how you handle your work and I know how good you are. But I also know sometimes you can become a bad boy in the organization so beginning from now, I will not tolerate, zero tolerance for abuses committed by the law enforcement agencies including the National Bureau of Investigation," Duterte said. Duterte said that he will be harsh but he reminded the PNP about the fundamentals of shooting criminals following issues of extrajudicial killings. The president told the police that they may only shoot criminals when they act in defense of themselves or a stranger and after announcing authority and the crime committed. President Duterte told the PNP that "If there is a resistance that plays your life in jeopardy then by all means shoot and shoot him dead. That is my order,". Duterte assured the police that he will protect them if they kill in the process of doing their duty. "Do your duty and if in the process you kill one thousand persons because you were doing your duty, I will protect you. And if they try to impeach me, I will hurry the process and we will go out of the service together," Duterte said. The President also added that he will provide the police force with funds and weapons in fighting criminality, particularly illegal drugs. Duterte stressed that it was not only a campaign slogan when he promised to raise the salaries of the police and the military. "We might not be able to stop it on time (within) six months but certainly six months and one day matapos na sana lahat. Tutal tama 'yung bayad ko sa inyo," Duterte said.